Resource Editor: How To Edit Accelerators that provide faster, more direct access to commands than menus do. Accelerators are closely related to menus both provide the user with access to an application's command set. Typically, users rely on an application's menus to learn the command set and then switch over to using accelerators as they become more proficient with the application. Accelerators provide faster, more direct access to commands than menus do. 1. Expand the Accelerator folder that’s found in the Resource Tree view, and select the target accelerator resource to be edited in the Resource Tree. You will see the ACCELERATOR table. 4. 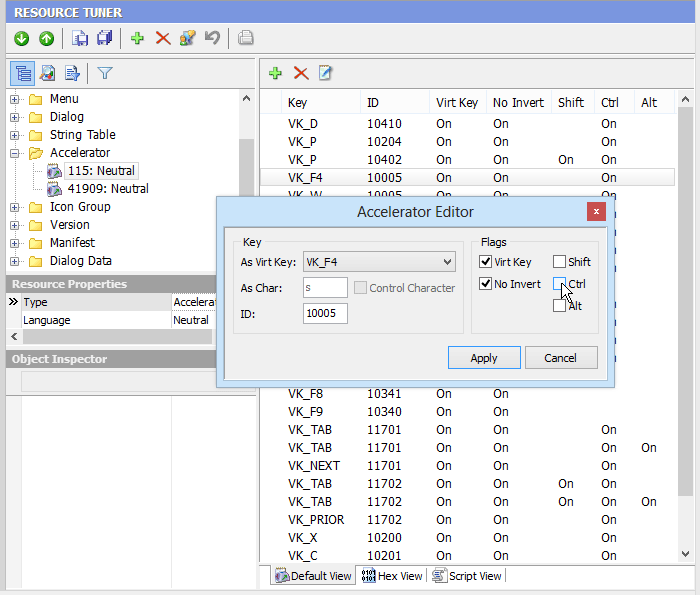 Press Apply to close the Accelerator Editor dialog and select 'File' -> 'Save File' to save the changes you've just made to the target file. 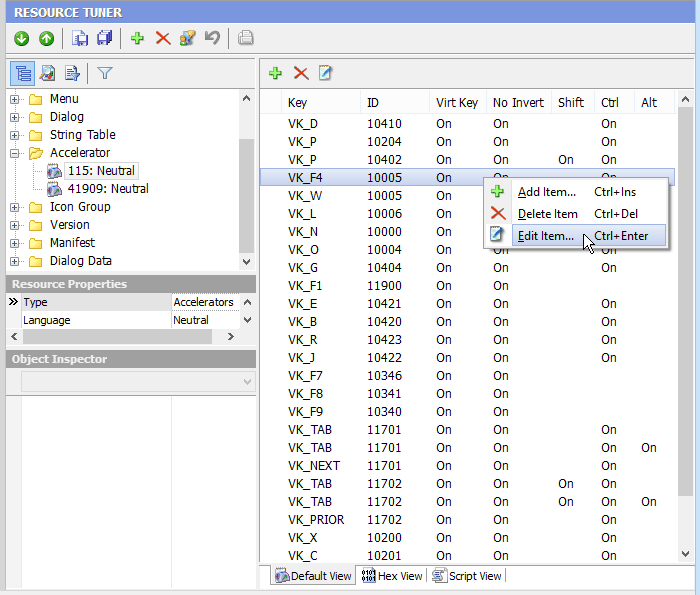 Any change you make can be restored prior to quitting Resource Tuner by using the Restore Data button. Accelerator IDs cannot be edited. These values are hard coded into the target file. Changing them is likely to cause the modified program to crash. Give Resource Tuner a trial run for 30 days free! Once you try it, we think you will find it hard to go back to other resource hacking utilities. So if you decide to purchase it, it's only $49.95 for a Personal License. Copyright © 2019 Heaventools Software. All rights reserved.